Hello, friends! Happy New Year’s Eve! It’s that time of year again, when we take a moment to look back at some of our favorite reviews from this past year: the books that filled us with hope, brought us joy, made us laugh, made us think, and inspired us to be our best selves. And just as it was last year, editing this list was EXCRUCIATING. But while we had leave out some incredible stories, we have decided on a list of the Top 20 books that made a lasting impression on both JJ and me. So here are, in no particular order, our Top 20 Reviews of 2018! Each one features a short summary and an excerpt from our original review that captures what made the book so special to us. Please note: not all of these books were released this year, but 2018 is the year we reviewed them. We hope they entertain and inspire you and your little bookworms in 2019! Please enjoy, and we’ll see you in the new year! This wordless picture books tells the earnest, compelling, and inspiring story of Vanessa, a new girl in school who suffers bullying, and nameless protagonist who decides to take a stand against it by showing empathy and kindness. Rather than a might-makes-right approach to fighting harassment, Kerascoët shows that sometimes, all that needs to be done is to show bullies that they will always be outnumbered by good and compassionate people. A pure, powerful, and deeply moving story about loss, grief, and supporting our loved ones in times of need or sorrow. Margot is sad because Tim is gone, but through the quiet and faithful support of her friends, she mourns his loss and begins to find peace. JJ adores this book – likely because of the soothing tone and color palette – and despite reading it dozens of times, it never fails to leave me misty-eyed by its gorgeous finale. When Mackenzie is humiliated once again for her short, unruly hair, she runs to Miss Tillie for a cry. Mack’s hair has always been especially hard to style – even her own mother doesn’t know what to do with it. Miss Tillie listens sagely, then agrees to teach Mack how to care for her hair. Excited, Mack asks if her hair will one day look like Miss Tillie’s smooth, elaborate style. But using her lush and lovingly-maintained garden as a metaphor, Tillie shows Mack that the style of the hair is not what matters, but that her hair is healthy, well cared-for and, most importantly, loved. A gorgeous tale of pride and acceptance for a gender nonconforming boy. Julián imagines himself as a mermaid, growing a tail of his own and long, beautiful hair that waves gently through the ocean, making friends with the sea creatures who love and accept him. Left alone as his abuela bathes, Julián is struck with inspiration: he sheds his normal clothes and crafts a mermaid outfit for himself, with a headdress of flowers and palm fronds, a long flowing tail made from a curtain, and a pop of lipstick to complete the look. Enjoying his new ensemble, he doesn’t hear his abuela exit her bath, and finds her staring at him in silence. At first, the reader and Julián think he must be in trouble… until he finds that acceptance is not only found in the sea. Finn loves the ocean, a love he once shared with his grandpa; he would have been 90 today. In honor of his grandpa, he has built a ship from scraps and flotsam – he hopes to one day take it on a voyage of his own, to find the mythical place his grandfather once spoke of, a place where ocean meets sky. After nodding off in his boat, he awakes to find that he has been swept out to sea – the journey has begun! Welcome, new person! Here we are; this is Earth, a big globe spinning in a massively bigger universe, and carrying all of human and plant and animal life as we know it. There are pointy, cold mountains, and hot, flat grasslands, and deep, mysterious oceans. There are all kinds of people here, all different shapes and sizes and colors, but all of them people just like you. It can be a little overwhelming, but we’ll take it step by step as you grow. We are here, after all – you’re never alone on Planet Earth. A young girl is collecting yellow flowers and bringing them back to her family, where they are holding a funeral for their recently deceased dog. She lays the flowers down over the large stone used to mark the grave and mourns. A short time later, the family leaves for a lakeside retreat. The girl is sad, watching other children play with their dogs, but at dusk she finds a small oval stone near the water. The art cuts to a large meteorite falling from space. It impacts, and the reader follows along as the stone takes an eons-long journey. As history plays out around it, the rock remains, until it finds itself at the shore of a lake, picked up by a little girl and brought to her home. She lays it on her dog’s grave in memory – a piece of time and the universe as the symbol of her love. This was one of JJ’s presents from Santa this year, and every re-read reminds me of how special a book it is. Life begins as something small, and then? It grows. As days and nights pass, it becomes larger, and different, and more incredible than the day before. Life comes in many forms, from the smallest insect to the biggest whale. But life is hard sometimes, and there can even be times when it’s hard to find the beauty in it. But we must push through, because the morning will bring something new, something unique, something incredible – because life is beautiful, and so are you. “Dear Girl,” each page begins, before imparting bite-sized wisdoms to its reader: “Keep that arm raised! You have smart things to say!”, “Look at yourself in the mirror. Say ‘thank you’ to something that makes you YOU”, and “Find people like you. Find people UNLIKE you.” Readers are encouraged to form supportive friendships, to ask questions, and to trust their instincts. And if they ever need encouragement, they can turn to any page in the book, and remember that they are appreciated, celebrated and loved for the dear girl that they are. A stylish and empowering book that pays homage to black boys and men, and the unique kingdom of the barbershop, a place of majesty and wonder where true works of art are created. It’s where a black boy can go and be treated like royalty, draped in robes and given a cut and/or style that makes him feel his best self. He can look around to see men – and women – who look like himself being fitted with their own fresh styles: flawless fades, a lion’s mane of locs, a shining wave, a razor sharp part, and the vitally perfect line. Each patron leaves looking and feeling regal, ready to take on the world with their power, grace, intelligence and soul, and the young man is no different. For each black boy has within him a king, and “the shop” is where he is crowned. A moving true story from one of the darkest moments in American history. Librarian Clara Breed’s young patrons come to turn in their library cards; she provides them stamped postcards in return. “Write to me,” she says, “and tell me where you are.” It’s WWII, and they are being forced into imprisonment by the US government for being of Japanese descent. Through the letters, Clara learns of the children’s lives: sleeping in deplorable conditions in internment camps, suffering extreme weather and limited food. Clara sends them books, school supplies, and always more postcards – giving them a voice in their time of tragedy. Franny’s father is a feminist. What does that mean? Well, Franny’s father believes that his daughter (and everyone else’s daughters too) can do anything boys can do, and that they deserve to have the same rights, freedoms, and opportunities. Franny’s father is a feminist, because he believes that boys and girls deserve a world in which they are treated equally. In 1977, Harvey Milk became one of the first openly gay elected government officials. The next year, he and his friend Gilbert Baker came up with a symbol to unite their community and the people who supported it, and to show pride: they created the first rainbow Pride Flag. Then later that year, the unthinkable: Harvey was assassinated because of one man’s hatred and fear. Yet despite his life being cut short, the seed of hope, courage, and pride that Harvey and Gilbert had planted with their flag had already taken root, and was beginning to grow. Perhaps not as weighty or serious as the other books on this list, but let me tell you: Huggy The Python was 100% JJ’s FAVORITE book this year. Aiming to help little ones learn basic social skills, both books introduce adorable characters with lessons to learn. For instance, Huggy the python loves to hug the things he loves, but he finds that when he hugs things too tight (such as a balloon or an ice cream sundae), he can break or hurt them. Similarly, Roary the lion loves to let loose his big roar, more often than not startling his family members. In both cases, the reader is employed to help teach the character how to calmly interact, making these wildly entertaining and interactive books stand out. We end our list with love. The first voices we hear, and the first faces we see, wide-eyed and smiling down at us in wonder: these are love. So, too, is the sunset sky over a happy home, no matter how modest. It’s in music, in words, in gestures of kindness. Love guides us when we are lost, comforts us when we are scared, supports us as we grow. And when the world is cold or cruel or darkened by hate, don’t despair – love will still be there to chase away the darkness once again. Hello, friends! As summer winds down and we start heading towards fall, we wanted to bring you a new Top 5 list! This month’s theme: Back To School! We’re taking a look at some of our favorite books about school and education. We’ve chosen books that recognize the trepidation that little bookworms may be feeling as the first day grows near and celebrate all there is to love about going to school: new friends, new experiences, and the power of education. One summer, a special building is built on an empty lot, and named Frederick Douglass Elementary. School thinks that’s a very nice name for himself, and he enjoys spending his days with Janitor, who comes to clean him. He tells Janitor as much, only to be surprised by his reply: soon, School will be filled with teachers and children who come to learn and play! How scary! Will they like School? Will they be nice to him? Will he make any friends like Janitor? The story follows School through his tumultuous first day and shows that even School gets first-day jitters. After an entire summer of playing with his dad, Oliver is ready to for the next adventure: his first day of school. But the first day of school can be a nerve-wracking thing… for Oliver’s dad! His dad complains of tummy aches and foreboding feelings, but Oliver reassures him: school will probably be lots of fun! The day that Oliver goes, dad gets left behind, and begins to worry more than ever. But after seeing Oliver happy with his new friends, we realizes that it’s time to let his little buddy strike out on his own. Vanessa, a new girl at school, is shy around her more boisterous classmates. When school ends, she walks home alone, where she is stopped by a bully who taunts her to the point of tears. Vanessa runs home crying, much to the dismay of another girl, who has watched the entire exchange. The girl worries over it all night, until she has an idea over breakfast. On her way to school, she stops by Vanessa’s house and offers to walk together. Vanessa accepts, and they chat as they go, until another friend joins them. Then another, then another, until a whole crowd of children is walking Vanessa to school, and she is protected from the chagrined bully. That day, Vanessa begins getting to know her new friends, finally feeling safe enough to come out of her shell. In a big house in China, a long time ago, there lived an enormous family. One of the grandchildren was Ruby, a little girl so called because she loved red and wore it every day. Ruby’s grandfather hired a teacher for the many grandchildren, and while it was unusual for the time, he allowed both the boys and the girls to attend lessons. Ruby loved school, and worked hard every day to master her subjects (harder even than the boys, because she had to spend her free time learning cooking and homemaking as well). One day, Ruby writes a poem for school that expresses her sadness at being born a girl. Her grandfather is concerned: why does Ruby think that the boys of the home are treated better? Will Ruby have the courage to speak her mind, and tell her grandfather of the opportunities she longs for? Changes can be daunting, especially the big ones. But it’s important to remember that when we say goodbye to the old, we say hello to the new. You may be sad that you’ve outgrown your beloved old sweater, but it makes room in your closet for a fresh new winter coat. It may be hard to give away your old tricycle, but it means that you’re ready to take your big girl bike out for a ride. Haircuts, new shoes, flying in a plane from home to go visit grandparents – leaving the old might be scary, but it allows to new into our lives. And after all that changing and growing, you might just be ready for the next step, and the one after that, knowing that for each goodbye, there’s a chance to say hello. That’s our list! Did we miss any of your favorites? Do you have a book you would like to recommend to us? Let us know in the comments, or message us from our Contact page. Thanks so much! Hello, friends! We’re here with a new Top 5 list for the month of June! And while June has many lovely holidays and themes to celebrate, we thought we’d take a look at one that’s dear to our hearts: LGBTQ Pride! We’ll already compiled one list of some of our favorite books with LGBTQ themes (which can be found here), so we’re back to kick off Pride Month with part two! It includes some of our favorite books that help introduce little readers to what the LGBTQ community and Pride are all about: acceptance, understanding, and the right to be who you are and love who you love. Told in cheerful rhyming couplets, the scene is set on a city getting ready for a very special parade! As the parade begins, people of all kinds march down the street: women on motorcycles, people dressed in rainbows and waving flags, musicians and performers and children and animals. Some of them look different, some are dressed in their own way, but all of them are there to celebrate one thing: unity. For on this day in June, it doesn’t matter who you are, what you look like, or whom you love; all that matters is that you come and be proud of who you are, inside and out. Errol and Thomas the Teddy are the best of pals. Every day they play together, eat together, and go on adventures together. One day, Thomas is sad, and nothing seems to cheer him up. When Errol asks his friend to tell him what’s wrong, Thomas nervously confides that he is afraid to tell Errol for fear of losing their friendship. Thomas has grown up as a boy teddy bear, but he feels in his heart that he is a girl teddy. He no longer wants to be “Thomas,” but “Tilly” instead. Errol hugs his friend tight, and assures Tilly that no matter what name, appearance, or gender makes Tilly feel most comfortable, Errol will always be Tilly’s best friend. At school, Stella’s teacher announces that the class will be having a Mother’s Day celebration, and the kids are excited. Everyone in class has a mom to bring (Howie has two! ), but Stella isn’t sure who to invite, as she has two daddies. Sure, her daddies do all the things that the other kids’ mommies do: make her lunch, help with homework, and tuck her in. Stella decides to invite her whole family to the party, because while she may not have a mom, she has plenty of people who love and support her. Following ten very different families – including nuclear families of different skintones, LGBTQ families, a blended family, a single-parent family, the family of a disabled child, etc. – the simple rhyming texts explores what makes a family. As we see, while the families may look different, they still care for each other when sick, eat meals together, spend time together, help each other through the hard times, and show each other support and love. Kelp was born under the ocean, but isn’t quite like the other narwhals. Still, he loves his home and his friends, who always make him feel safe and loved. But one day, a strong current sweeps Kelp away from his home. He ends up near an island, where he sees a fabulous creature that looks just like him! He learns that the animal is called a unicorn, and he is one too! The unicorns welcome him gladly, and teach him more about being a unicorn. Yet while Kelp is happy to be with unicorns like him, he misses his narwhal friends in the ocean. Kelp is caught between two worlds – which should he choose? That’s our list! And stay tuned: we’ll be reading more books all this month that celebrate Pride! Did we miss any of your favorites? Do you have a book you would like to recommend to us? Let us know in the comments, or message us from our Contact page. Thanks so much! Hello, friends! It’s a new month, so we’ve got a new Top 5 list for you! 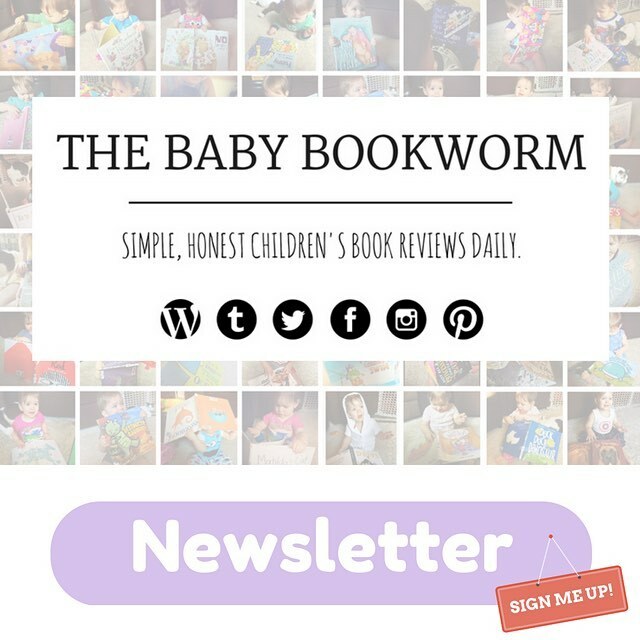 As it so happens, several friends of The Baby Bookworm have welcomed new additions over the last month, so we thought we’d celebrate these growing families with a list of our Top 5 New Baby Books! Whether helping older siblings with the transition, bringing a little levity to the stressful lives of new parents, or simply welcoming the new arrivals themselves to the world, these books are perfect for the newest bookworms on the block. Hello, new person! Here we are; this is Earth, a big globe spinning in a massively bigger universe, and carrying all of human and plant and animal life as we know it. Created as a gift for his first child, Jeffers brings care, humor, and deep affection in both the text and art, assuring Earth’s newest arrivals that there is a whole universe to explore as they grow, and that they are never alone in it. When King Baby is born, it is clear that he is the ruler of all he surveys. People crowd around to greet and fawn over him. He is given mountains of gifts as tribute. His loyal servants (otherwise known as Mommy and Daddy) fulfill his every need and whim, even if they are occasionally simple fools who do not understand his instructions. This hysterical look at the first year of #babylife will make new parents laugh along with their little ones. When does a mother or father begin to love their baby? From the day they meet them? No no, the love between a mother or father and their baby began long before that. It began before the flight of birds, and before bees made honey. It came before rivers and sunsets and even the silvery glow of the moon. Before all of that, there were two bright points of light traveling through the stars, destined to meet – and that’s when a parent’s love begins, and waits for the day that ”you and me” becomes a ”we”. The unnamed young protagonist knows her baby sister is on the way – she can see the swell of her Mama’s belly like a rising sea. And she has a number of questions about the new arrival: Will her sister know her, when she arrives? Will she have freckles like her? Will the girl have to share her beloved blanket with the baby? And lastly, will her parents have enough love for her and the baby to share? Welcome! You have officially been born, and are now experiencing life. It’s a big, complicated thing to do, so we hope that this introductory guide will help you navigate some of the major points. Occasionally, there may be disappointments, like injustice or spilled ice cream. But there are people working to make this world better for you all the time, and we can share our ice cream. Overall, there will be much to experience; the good, the bad, and the very silly. We’re so glad that you are you, and that you are here, and that we are reading this book together. That’s our list! We’d also like to note two favorites not on this list: Little Big Girl by Claire Keane and Love Is by Diane Adams! Both are gorgeous and touching stories, and the only reason we didn’t include them here is because we’ve featured them in previous lists. Did we miss any of your favorites? Do you have a book you would like to recommend to us? Let us know in the comments, or message us from our Contact page. Thanks so much! A fox wanders what used to be the fields and forests of his home, now a confusing landscape of concrete, cars, and people. He has been separated from his family by an interstate, and he spends his days exploring the unfamiliar area. One day, he finds some humans building a tunnel under the freeway, and when he explores it, he finds that it leads to a wildlife preserve… and his family! Pandora lives all alone in a land of broken things. She uses her cleverness and ingenuity to build a cozy home and fix lost treasures, but she is still lonely. One day, a small bluebird injures itself nearby, and Pandora takes the little bird in. The two grow close, and when the bird is healthy enough to fly away, it always returns with treasures from far-off lands, fixing them into a nest as a gift for Pandora. One day, the bird doesn’t return, and Pandora is broken-hearted. But when she wakes one sunny morning, she finds that once the seeds of friendship are planted and nourished, they will grow – and that it may take a while, but true friends always find their way back home. This wordless picture book begins with a teacher telling a class of students, including the protagonist, that the next day will be show-and-tell; they should bring something precious and old. The little girl protagonist knows just what to bring: her beloved toy fox, which she has had since she was a baby as a constant companion. After class, she brings the little fox to the playground with her friends, but as she is enjoying the swings, a real-life fox snatches it from her backpack! The little girl and her best friend race after the fox, going on an adventure through the woods that parallels the adventure of the toy fox and its new owner. Will the little fox find its way back home – or will home become something new and unexpected? Marco the fox is filled with big questions. His fellow foxes have little interest in his questions, content to their workaday lives. So when Marco sees the antlered ship dock in the harbor, and the captain offers work as a crewman, Marco accepts. But once the new crew disembarks, they find that sailing a ship is difficult work. Finding what they are each talented at, the crew eventually bands together and becomes a great team, each discovering what they initially sought – except for Marco. He still has more questions… but perhaps he has found the answer to one of them without even realizing.